Trying to decide what is better for your needs? 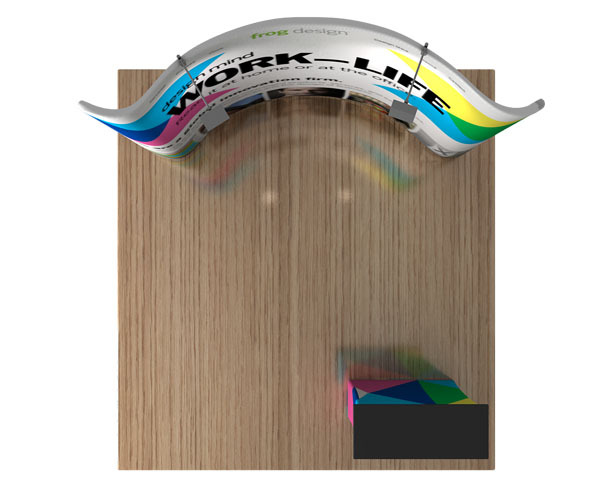 Straight or curved Tension Fabric Display Stands? It's all a matter of personal preference. Personal opinion we enjoy the curved 10 foot frame over the straight one, and that being said we enjoy the straight 8 foot over the curved one. This is because the smaller width frames make the curved more pronounced and with the 10 foot the curve is more subtle. Once again this is all personal preference. 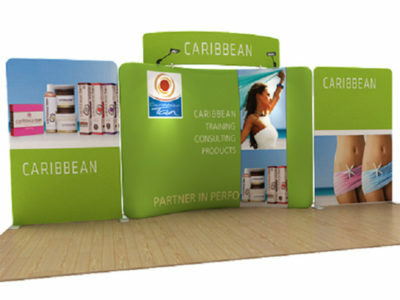 A benefit for curved stretch fabric frame systems is that your potential clients can see the stand from a wider angle. A fun a funky design, B-Series Wave Displays are curved on the vertical part. They can accept shelving units and LCD Screen brackets. They have support legs on the back for stability. 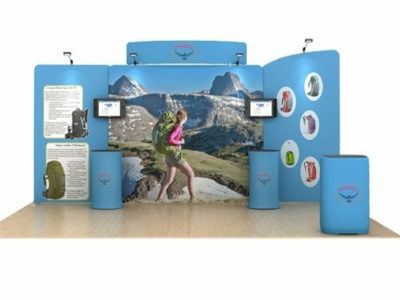 Lightweight and versatile, find out why many forward thinking companies are switching to our Wave Tension Fabric Displays for their Exhibition Booths. Some benefits include that it’s economical, and it’s easy to set up and easy to transport. Rich and vibrant replaceable graphics and they have a quick turn around time. Tension Fabric Displays have gained popularity over the Pop up Display due to the fact that it does not have so many moving parts. This means if it’s dropped it’s much less likely to damage. Waveline Tension Fabric Displays are also known as EZ Tube displays and other various brand names. Once you own the frame you can order new pillowcase style fabrics at a fraction of the original cost. These stands have a cleaner look than many trade show displays at the same price point. A Tension Fabric Display can create a big impact for a low price! Plenty of Accessories are available such as headers, shelves and lighting. 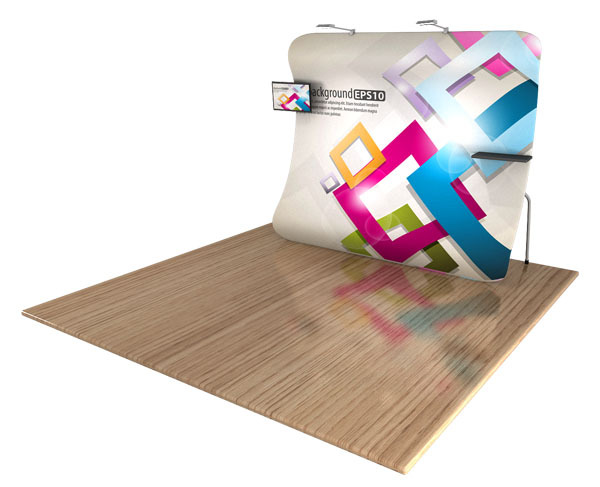 The benefit of this Trade Show Display is the ease of setup, virtually anyone can do it! Top assemble simply join the numbers together. There are stickers on each of the legs. Simply join…. 1 with 1, 2 with 2 etc etc and you’ll have your Tension Fabric Trade Show Display frame complete! After that… simply slide your graphics over the frame like a giant pillowcase and zip it up on the bottom. A padded soft case is Free with your order. Up your Game! – Stand out from the Crowd! that you want to portray to your potential clientele. 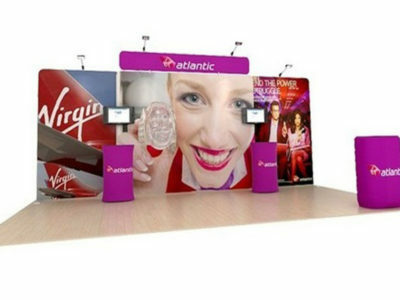 Ask us for a free consultation how we can design your entire booth area with accessories, and different sized displays. A typical 10 foot backdrop is common, and the minimum you need for a respectable booth. 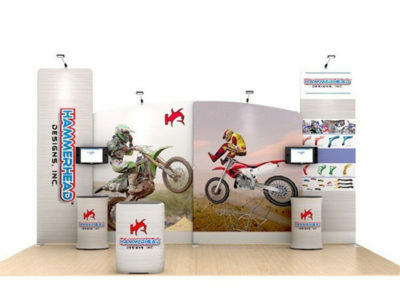 Adding Retractable Banner Stands, and other Tension Fabric Displays and Accessories will ensure your booth stands out. We ship for free throughout Canada, USA, and most places worldwide! Including Vancouver, Calgary, Edmonton, Toronto, Montreal, Halifax, San Francisco, Los Angeles, San Diego, Las Vegas, Miami, Washington, Seattle, New York, Boston, Florida, Dubai, UAE, Abu Dhabi, Qatar, Malaysia, Saudi Arabia, Australia, Japan, Singapore, Nigeria, Kenya, Netherlands, UK, Spain, France, Mexico and more.